“Pretend that these poems by Lawrence Raab have come to you from very far away. Think of them as written by Poet Z, a heretofore-unheard-of Eastern European poet, a Kafka-Andrade-Calvino character from Serbo-Chechnya-Lithuania. What’s in his poems? Angels and human monsters, decades and generations, universities turned into ashes, the consolation of philosophy, despair in the middle of the night, a tutorial in lucid dreaming. Only his poetic humor gives away his American citizenship. His poems lead you into, then trap you, in strange worlds, boxes constructed of story, logic, and aphorism, which then are revealed to be exactly like life itself. Tupelo Press is pleased to provide the Mistaking Each Other for Ghosts Teacher’s Companion in free, downloadable PDF format. birds in the woods still singing. So it isn’t night completely. and run off before they’ve been touched. this game herself. What was it called? Or perhaps it never had a name. 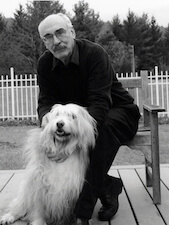 Lawrence Raab is the author of seven previous collections of poems, including What We Don’t Know About Each Other, which was a finalist for the 1993 National Book Award. He has received grants from the National Endowment for the Arts, the Massachusetts Council on the Arts, and the Guggenheim Foundation, as well as numerous residences at Yaddo and MacDowell. He teaches literature and writing at Williams College.